THE 12 DAYS OF HAPPY PEZ-YEAR! 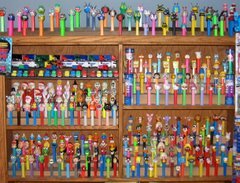 Instead of Santa bringing a PEZ to each stocking on the 25th we could post one (or one set) per day for the next 12 days after Christmas thru New Years and beyond. Well considering I won't be there for all the fun I wouldn't mind it being on the blog, however it can't be replaced by getting one in a stocking or in another place. that is just too much fun. Whatever is decided is fine with me as long as they get posted one way or another.